Wedding invitation suites - Polina Perri's complete solution for fashion-forward brides. To make your special day a unique occasion, you start with a small detail that matters - your wedding invitations. Besides their purely informative purpose, the wedding invites are meant to give your guests insight of your wedding theme and style. To make its best, a perfect wedding card pairs luxurious design with craftsmanship, ease-of-use with the clear and elegant manner of presentiation. - a wedding invitation suite is all-in-one wedding stationery unit. A pocket format card is the outer three-folded case. An insert with main invitation wording is placed in the centre of this case, having special side folders to fix the card in. Virginia decor - a delicate ribbon with an elegant jewellery centrepiece - embellish the upper flap. The lower part of the Virginia outer case has a handy 'pocket' providing the space for a reply card and an additional insert/ inserts (if needed). A main insert features the invitation wording. Being a core of your wedding invite, a main insert informs the following: the hosting party, the couple's names, date and time of the wedding, location of the wedding ceremony, the location of the reception to follow/the venue name, even RSVP request can be mentioned. This card is inserted in the pocketfold case, it is made of shimmery design cardstock and outlined with elegantly embossed framing. A response card with its envelope is a practical tool for getting the feedback from your guests. With the help of a response card a guest confirms the presence at your event or politely refuses to attend: both options are provided. Besides a reply card may allow for specifying your quest's dietary requirements and the number of persons attending the ceremony. Another useful attribute of response cards: they help you to gather and analyze necessary information, so needed for successful wedding planning. To make the replying easier, opt for printing a return address on the envelope. An extra insert features any significant additional details having to do with your occasion. As a rule, an extra insert presents the following pieces of information: menu choice, accommodation, directions and transport info, map and wedding gifts info, even romantic poems! An extra info card/cards are inserted in the 'pocket' together with a response card, that prevents their losing. No doubts, your guests will appreciate this easy-to-use invitation, designed for keeping all pieces of wedding stationery together for their convenience. An invitation envelope perfectly complements the Virginia wedding invitation suite; shimmery design paper of ivory hue highlights the sleekness of the Ivory Virginia design. An envelope's dimensions provide enough space to fit in a pocketfold invite together with a response card and extra inserts. If you want the addresses of your invitees to be printed rather than handwritten - choose 'printing of main envelope' option to get the invitation envelopes professionally printed by Polina Perri experts. 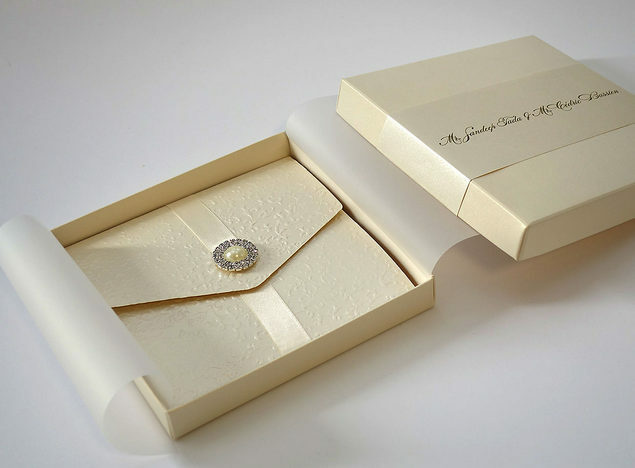 Polina Perri offers you an exquisite alternative to an envelope - sublime boxes for invitations. The wedding invitation boxes are perfectly tailored to give your card a completed and extraordinary look. You may decide between 2 equally elegant boxes to match your Ivory Virginia card: Ivory Box-Bow-Pearl 157 Ivory Box-Bellyband 157. Both wedding boxes are made of ivory cardstock with the trademark lustrous finish, are made in the same Virginia design concept. While an Ivory Box-Bow-Pearl features a ribbon band with Dior bow decoration, the Ivory Box-Bellyband is topped with a wide customizable paper band. It can bear any design, wedding logo with initials or any other lettering you want. 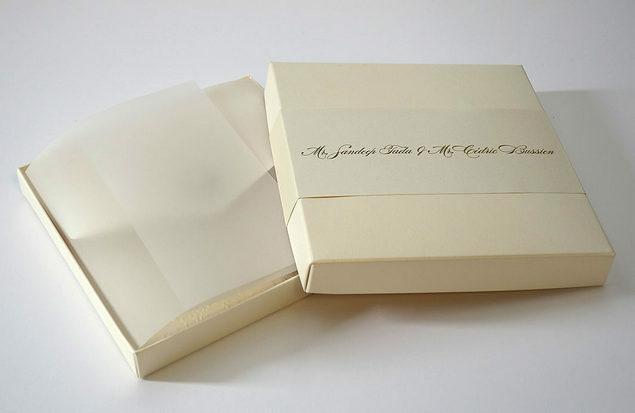 Both boxes come with translucent lining paper inside, which is used to wrap your invite and add a value to its presentation. Imagine the anticipation of your guest who opens the box, unfolds a lining paper to discover this sumptuous wedding invite! 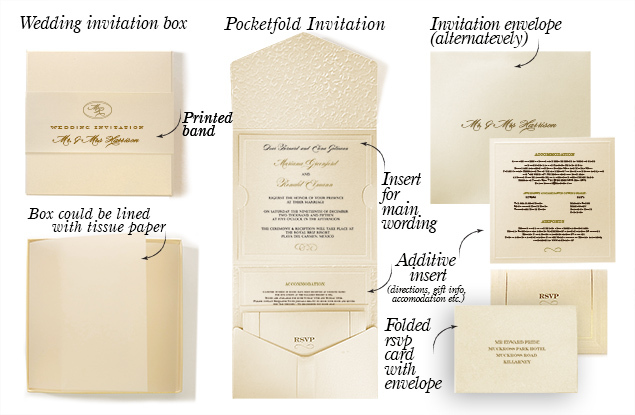 Assembled, the wedding invitation suite becomes a signature unit, the unparalleled beauty and quality of which makes the wow-effect. Indulge yourself with this extra special wedding stationery, flawless and captivating one.